Recreational marijuana could bring hundreds of millions of dollars in new tax revenue to the state by 2023, according to a new report from the Senate Fiscal Agency. The agency, which is nonpartisan, has “provided sound and unbiased assistance to the Senate and the residents of Michigan,” according to the website. If voters pass Proposal 1 in November, the analysis found that by 2022-23, Michigan could get $287.9 million in new tax revenue. After taking out the loss from the medical marijuana excise tax, the total tax revenue for the state would be $262 million. That combines the excise tax revenue and license fee revenue from the Marijuana Regulation Fund (182.3M) with the sales tax revenue ($105.6M). As part of the proposal, marijuana retailers and micro-businesses would have to pay a 10 percent excise tax on the sales price of marijuana that is transferred to anyone other than a marijuana establishment. That’s in addition to all other taxes. “Whether you take our conservative estimate or the state’s more bullish estimate, the key thing is that voting yes on Proposal 1 will help the state collect significant and much-needed tax revenue that it is not receiving today,” Josh Harvey, a spokesperson or the Coalition to Regulate Marijuana like Alcohol, said. Scott Greenlee, a spokesperson for Healthy and Productive Michigan, a group against marijuana legalization, disagrees saying marijuana legalization will cause many issues for businesses. There would be additional costs to the state, according to the report. The Michigan Department of Licensing and Regulatory Affairs (LARA) would regulate marijuana businesses. According to the report, the department would need 27 more full-time positions which would cost $2.5 million. The Michigan Department of Treasury would have additional administrative costs including IT and processing costs. According to the report, those include a one-time implementation cost of over $1.9 million to set up the new tax system and $1.2 million in ongoing costs to support four full-time employees. On top of those costs, the treasury department said more support and staff would be needed for the tax process and business service units because the marijuana business is primarily cash-based. While those costs aren’t final and would depend on the volume of sales, it would start with 12 full-time employees and $1.75 million and stay there if the sales were low. If sales went up, it could be as high as 22 full-time employees and $3.1 million cost, the report says. 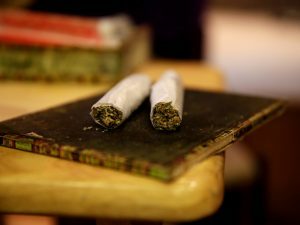 The report also said that there could be a positive impact on state and local government because of fewer arrests due to marijuana laws. It said that fewer felony arrests & convictions could lower the demand on both court systems, community supervision groups, jails and correctional facilities. In 2016, the report says there were 199 people sentenced to prison for a marijuana-related felony conviction and 4,620 sentenced to jail, probation or a combination of both. “For any decrease in prison intakes, in the short term, the marginal cost to State government is approximately $5,313 per prisoner per year,” the report said. “The average cost to State government or felony probation supervision is approximately $3,024 per probationer per year.” The report did say that any decrease in fine revenue would then lower funding to public libraries. As for the estimate of the first-year after the legalization of marijuana, the SFA report says there would be a total of $77.1 million in total tax revenue when taking out the loss from the medical marijuana excise tax. That would double in 2020-21 and then increase to $241.4 million in 2021-22 before hitting $262 million by 2023, the report shows.